Please subscribe to our Facebook Events Feed or Subscribe to our eNewsletterto receive notices. WILKES-BARRE — Friends of the Little Theatre of Wilkes-Barre gathered in the lobby of the historic North Main Street venue Friday evening for a Christmas Wine and Wishes reception. The event kicked off a capital campaign, during which organizers hope to raise $1 million by the theater’s 100th anniversary in 2022. “It’s the third-oldest theater in the United States. That’s significant,” said Wilkes-Barre City Council member Tony Brooks, who showed his support by attending in costume as General Lord Butler, who was a councilman in the early 1800s and also, an ancestor of Little Theatre of Wilkes-Barre Community Board member Cornelia Conyngham Romanowski. “How many ‘greats’?” Romanowski pondered, as she and Brooks came up with the answer “three.” The historic Butler was her great-great-great-grandfather. “Hopefully it will be here for a long time,” said attorney Tom Mosca, of Dallas, who attended with his wife, Andrea. The Moscas said they were looking forward to attending Little Theatre’s production of “A Christmas Carol” with their daughter, who would be home on break from law school. That show would end its run with final performances on Saturday and Sunday, and Little Theatre’s development director Walter Mitchell added to the ambience of the Friday evening reception by sporting an old-fashioned white wig — a la his character, Scrooge’s one-time employer, Fezziwig. He is eager to work toward the $1 million goal by raising $200,000 by the end of 2017, which would bring in a matching $200,000 from an angel benefactor who wishes to remain anonymous. The dozens of people who showed up on a snowy Friday evening got the project off to a good start by donating $19,253. Supporters like Cynthia Post, who attended Friday’s reception, agreed the theater is a worthwhile cause. Mitchell vowed earlier this year to devote himself to seeking donations. Individuals who are willing to help may send checks made out to Little Theatre of Wilkes-Barre with a notation in the memo line that it is for the campaign. Checks may be sent to Little Theatre of Wilkes-Barre, in care of P.O. Box 1, Wilkes-Barre PA 18703. That low-as-you-can-go box number is not a mistake; it’s an indication of how long Wilkes-Barre’s Little Theatre has been part of the community. WILKES-BARRE — Saunders and his assistant, Max, are pacing around the sofa in a hotel suite, going over the way Max is supposed to handle the star tenor who is soon to perform with their opera company. “You will stick to him …” Saunders prompts. It sounds like a tall order for Max, the young protagonist in the farcical “Lend Me A Tenor.” How will he cope? No doubt audiences will root for Max’s big heart to triumph. Will his dream of becoming a star himself come true? Well, maybe it will get a boost when Tito the tenor advises Max to loosen up and sings the aria “Dio, che nell’alma infondere” with him. This being a farce, you can expect mistaken identities and shouting and all sorts of amusing chaos. For a while, Fortin will even have to play dead, which means it’s imperative not to laugh at the rest of the cast’s antics. “I really have to try to zone them out and pretend they’re not there,” he said. Fortin has been singing for 20 years, since he was “thrown onto a stage at age 12” and earned a scholarship to the Westminster Choir College in Princeton, New Jersey. While his training there was serious, this play is more “laugh a minute,” as Giordano puts it. Adding to the hilarity will be Deirdre Lynch as Tito’s jealous wife; Jim Pall as Saunders, the opera company manager; Breana Schall as an ambitious soprano; Carol Sweeney as the head of the opera guild, John Beppler as the singing bell hop; and Caitlin Harty as Maggie, a young woman, with a crush on Tito, who doesn’t quite appreciate the affection Max is aching to bestow on her. “It’s like puppy love,” Harty, 26, of Shavertown, said of Maggie’s feelings for Tito. Reach Mary Therese Biebel at 570-991-6109 or on Twitter @BiebelMT. A casino, a bodyguard, a con artist or two, and some wealthy young women. Love, lies, and even a few laughs. 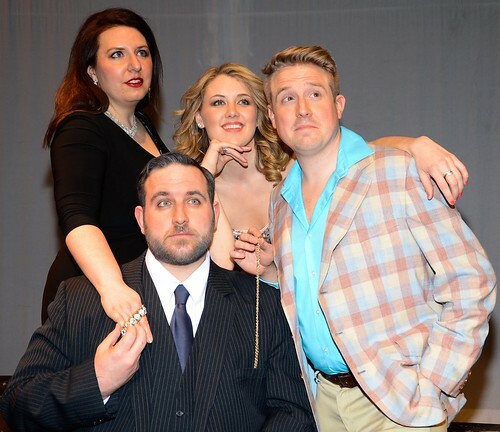 Little Theatre of Wilkes-Barre presents the comedic musical “Dirty Rotten Scoundrels” beginning Friday, April 21 at 8 p.m. and running through Sunday, April 30. The show is directed by Katie Lane and choreographed by Michael Marone, with musical direction by Todd Christopher. According to Dane Bower, who plays con artist Lawrence Jameson, the show involves an older conman (Lawrence Jameson) who takes on the challenge of mentoring a younger con, Freddy Benson (played by Ian Owens). At first, the two work together but soon realize the area isn’t big enough for both of them. Toussaint said she sees similarities and differences between her and her character. “I am like her in that I am easily overtaken with awe in even the smallest of wonders and in that I suffer from wanderlust,” she explained, adding that people will have to come and see the show to learn how the two differ. The production has been exciting to work on, she continued. “I love many facets of this show, from the exotic and luscious setting to the strong, distinct personalities of each of the characters, to the subtle innuendos and quick, but hilarious remarks that come and go so rapidly that you do yourself an injustice if you blink,” she described. Dirty Rotten Scoundrels opens at the Little Theatre of Wilkes-Barre (537 N. Main St., Wilkes-Barre) at 8 p.m. on Friday, April 21. Additional shows are at 8 p.m. on April 22, 28, and 29, with 3 p.m. matinees on Sunday, April 23 and 30. Tickets are $20 and can be purchased at the Little Theatre box office or at ltwb.org. Director Katie Lane says that, in addition to the fast-paced plotline, the show also has an outstanding, jazzy score. Bower added that the musical does an excellent job of maintaining the plotline of the 1988 film (which was directed by Frank Oz and starred Steve Martin and Michael Caine), but also advances the story through music. LTWB News: Congratulations to our NEPTA Winners! CONGRATULATIONS to all of our NEPTA Award Recipients from the 2016 season!!! 7 in total!!! Wonderful job everyone! We are so proud of all of you! PLAINS TWP. — More than 30 local nonprofit groups talked about their missions and the challenges they face Thursday during the Luzerne Foundation’s annual nonprofit forum at Holiday Inn East Mountain. Leaders from groups with missions ranging from promoting childhood literacy to providing dental care for the uninsured took the opportunity to explain their needs to members of the foundation’s grant committee, which will choose grant recipients at the group’s annual meeting May 10. Charles Barber, president and CEO of the Luzerne Foundation, said the organization is re-working how it distributes its grant awards this year, which he hopes will make a greater impact on the nonprofit groups aided through the foundation. WILKES-BARRE — The cast of Little Theatre of Wilkes-Barre’s “Angels in America, Part One” was thrilled to learn on Sunday that judges at the Pennsylvania Association of Community Theaters’ PACTFest admired their work so much they awarded the local group the chance to advance to further competition. Judges in the PACTFest competition, which was held in Williamsport, praised Little Theatre for taking on Tony Kushner’s “Angels in America,” which deals with the AIDS crisis in the 1980s, because it is not often brought to the stage, Parmelee said. They also awarded cast member Mandy Pennington an Outstanding Actress award for her portrayal of Harper Pitt, a fear-filled woman who hallucinates and obsesses as her marriage falls apart, and they awarded Dave Reynolds an Outstanding Director Award. The PACTFest competition limits performances to one hour, and “Angels in America” is a three hour play so the Little Theatre group consulted the playwright about condensing it. The Little Theatre of Wilkes-Barre never fails to impress me. Mandy Pennington received the “Outstanding Actress” award for her portrayal of Harper Pitt, while director Dave Reynolds won an “Outstanding Director” award. “She’s tremendous,” Olson said, referring to Angel Berlane Mulcahy’s performance as Maggie in the Little Theatre of Wilkes-Barre production, which continues through March 5.